Star Wars is an epic good versus evil tale and The Adventures of Luke Skywalker, Jedi Knight retells the Star Wars story as told in the original movie trilogy: A New Hope, The Empire Strikes Back, and Return of the Jedi. This book is those movies transferred to print format and will appeal to many young Star Wars fans. As a picture book with lengthy text, it’s most appropriate for confident readers. They will find all their favourite characters present: Luke, Obi Wan, C3PO, R2D2, Han Solo, Chewbacca, Princess Leia and Darth Vader. There are also plenty of memorable scenes and action galore. 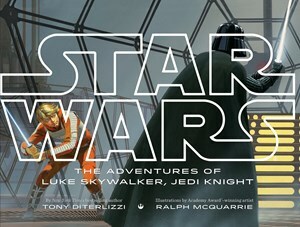 Author Tony Diterlizzi is a lifelong Star Wars fan, and illustrator Ralph McQuarrie was the concept artist for the movie trilogy. His work is reproduced for this book, and is a visual reminder of the movie, but also unique - Yoda, for example, looks rather different to what we remember on screen. The book’s large, landscape format suits the visual storytelling and encourages readers to explore its detail. Star Wars might be a story from a long time ago, in a galaxy far, far away, but it’s one that a new generation of fans can enjoy thanks to The Adventures of Luke Skywalker, Jedi Knight.